Another gorgeous Tambo Teddy was chosen by the Government as Queensland’s gift for Royalty. Six days before Prince Harry and Meghan were to visit Queensland, Alison’s mobile rang and an aide from the Premier’s office said the Premier would like to speak with her and asked if she was able to take the call?…………………………..Ah yes………..happy to chat, Annastacia! 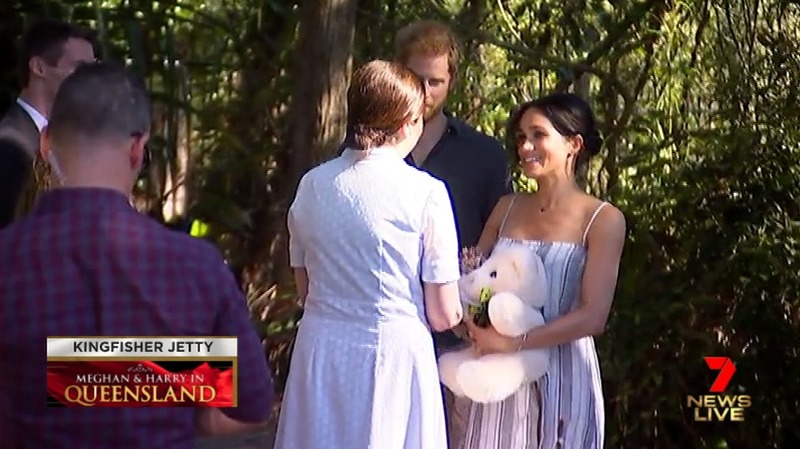 And the reason for the call ………………to order a Tambo Teddy for the Duke and Duchess of Sussex as Queensland’s gift. A little bit of deja vu…………A Tambo Teddy was Queensland’s gift to Prince William, Kate and Prince George when they visited in 2014. What an endorsement………..what excitement……what a whirlwind…….can it get any better? The Premier also told us how her father, a former Minister in the Queensland Government had also said, ‘You’ll have to get them a Tambo Teddy!’. A large cream basil was the chosen one, a pristine beautiful woollen bear for the next royal baby. After the phone call, Alison ripped down the road to the shop, selected the bear off the shelf and named it ‘Stirling Downs Sussex’. Verna tied the bow, a green with black spotted bow (suitable for a boy or a girl) while Alison wrote the card (it only took 3 attempts), and the bear was in the mail. Premier Annastacia Palaszczuk presented the bear to Duke and Duchess on Fraser Island on Monday afternoon (Oct 22nd) and our website went wild! We are so proud to have had this recognition once again and do consider it is a ringing endorsement of our bears, they are beautiful, quality products absolutely fit for Royalty!